Available in a range of body styles and trim levels, the Skoda Octavia is designed for all-round family fun. The hatchback version benefits from a finely sculpted appearance and refined interior, while its spacious cabin and high spec interior ensure an enjoyable ride for all. 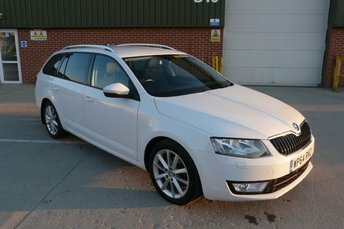 You can come and take a closer look at the selection of used Skoda Octavia models for sale in Elvington right now by paying a visit to Yorvik Cars Limited in person. Alternatively, browse our vehicles here on the website ? just be sure to contact a member of the showroom team if you've any questions or would like to arrange a test drive. Finance is available to UK residents aged 18 years or older, subject to status. Terms & Conditions apply. Indemnities may be required. Other finance offers may be available but cannot be used in conjunction with this offer. We work with a number of carefully selected credit providers who may be able to offer you finance for your purchase, commission may be received. We are only able to offer finance products from these providers. Postal Address: Yorvik Cars Limited, Unit 6 Handley Park, Elvington Industrial Estate, Elvington, York, Yorkshire YO41 4AR. Find contact details here.